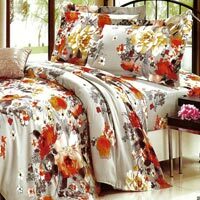 Our Luxury Dream Bed Sheet Set is available in lively patterns. Luxury Dream Bed Sheet Set that we provide is made of Glace Cotton Brushed fabric, and is therefore very soft and cozy to touch. Along with the bed sheet, we also offer flat sheet and pillow cover in our Luxury Dream Bed Sheet Set. Clients can get Luxury Dream Bed Sheet Set from us at reasonable prices.